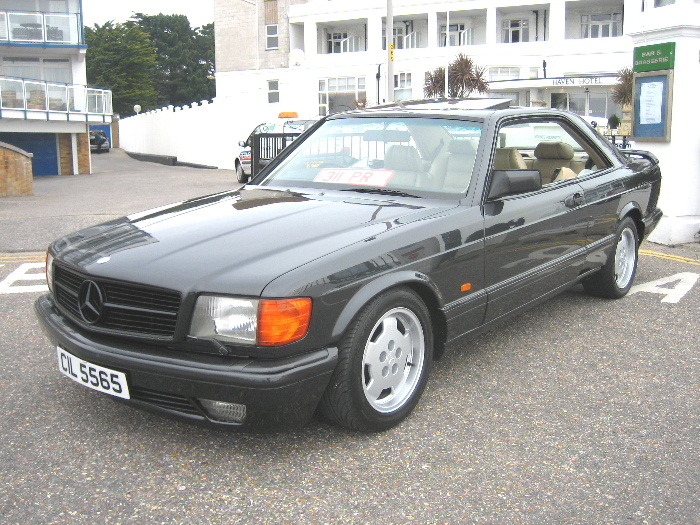 MERCEDES-BENZ 560 SEC FH, Automatic, Coupe, 1990, Diamond Black Metallic. ABS, Adjustable steering column/wheel, Air conditioning, Alloy wheels, Anti theft system, Body kit, Central locking, Colour coding - Body, Cruise control, Electric mirrors, Electric windows, Electric sunroof, Foglights, Electrically adjustable seats, Front armrest, Head restraints, Headlight washers, Heated seats, Leather upholstery, Limited slip differential, Immobiliser, Power assisted steering, Rear armrest, Radio/CD, Self levelling suspension, Rear headrests, Sideskirts, Spoiler, Tinted glass, Traction control, Wood/wood effect trim. Tracker GPS Security System,Full and Total Service History,Private Plate Included,Drives Superb,Sold with MOT-Service.